Good Morning ! 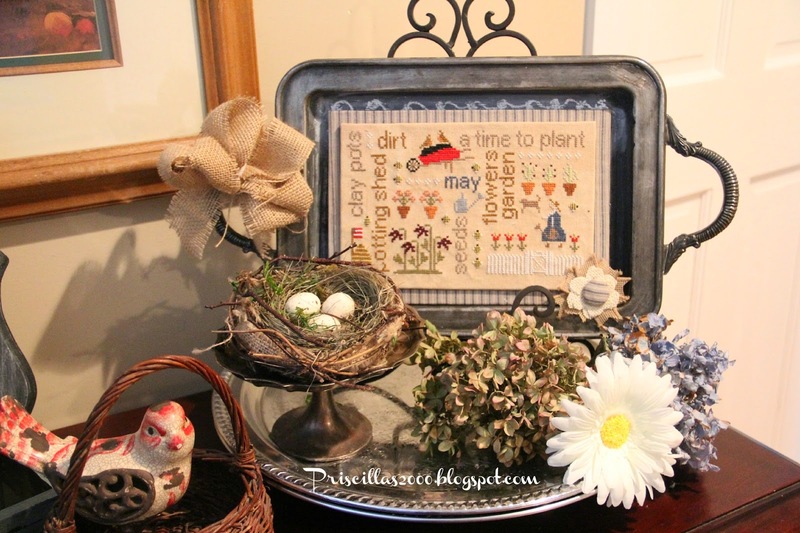 I finished stitching up the May With Thy Needle and Thread Wordplay last night. This morning I got it ironed and mounted .. I used blue ticking fabric for the background and for a covered button for the little burlap flower. Its mounted with a magnet and a piece of sheet metal to this thrifted silver tray . You can see April, March and February by clicking on the links.. I changed one of the words to a couple more bees.. The bees are the cutest things ! It is all done in DMC floss ..I have started on the Country Cottage Needleworks May Cottage , but not too much progress yet ! Hope you all have wonderful weekends ! Thanks so much for stopping by ! I would love for you to follow me on Instagram, Facebook and Pinterest , Etsy..all the links are in the sidebar ! 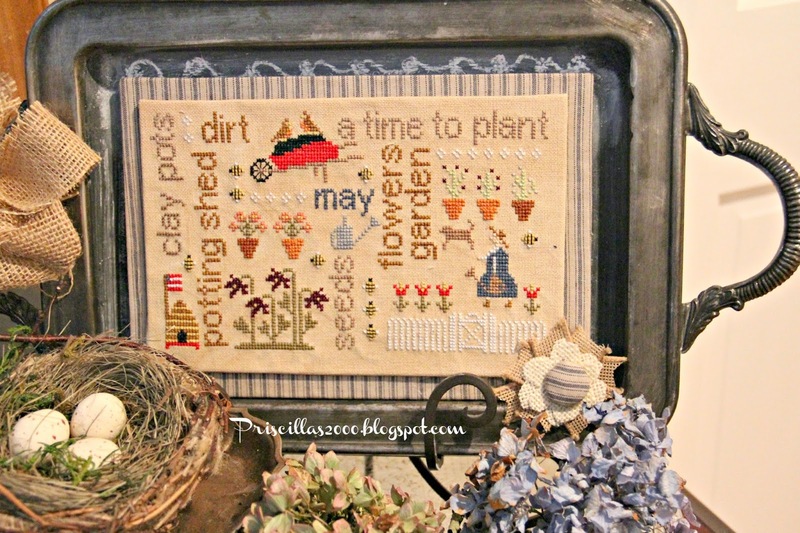 Love this word play finish, Priscilla--good call on adding more bees :) And I really like the burlap flower you've accented it with! I just love the way you are displaying the Word Plays! Thanks for the reminder, I will have to get my May out! I just love all of your word plays, I really think I need!! to stitch them, you make them look so lovely. Its nice to have one for each month, I think these will have to be a new project for me! Love this finish ~ so creative! 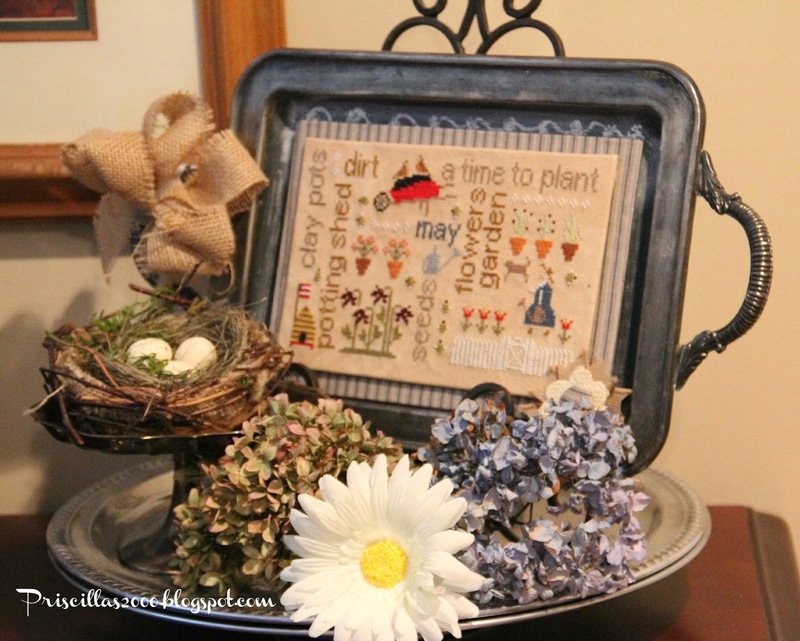 Oh I love your sampler, gorgeous and displaying it with the tray background is so creative. Thanks tons for linking to Inspire Me. 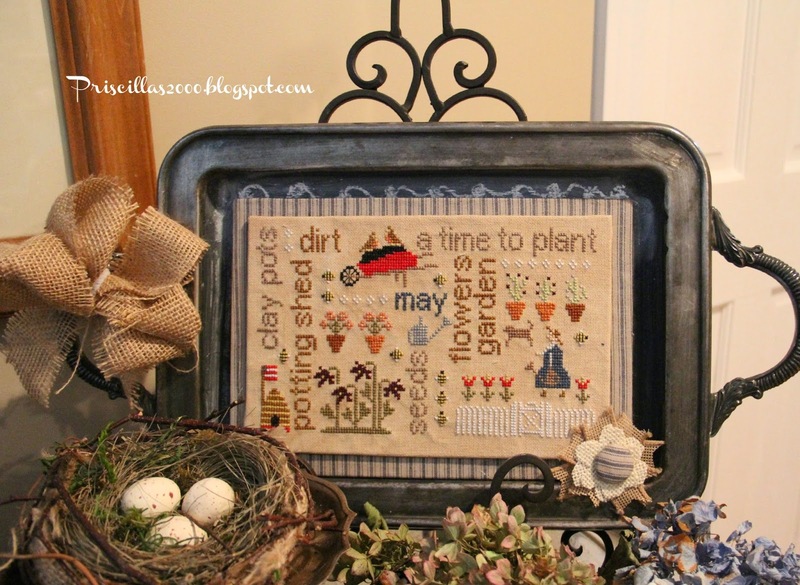 I love your sampler and mounting it on the tray is genius. The silver tray was a great choice for a mounting board. Wonderful job! So cute, and really nice stitching! Priscilla I just love these little stitching's! Looks great mounted on the tray. Thanks for sharing with SYC.